After celebrating the New Year at the wonderful San Isidro Lodge, we spent 6 nights at Wildsumaco Lodge. 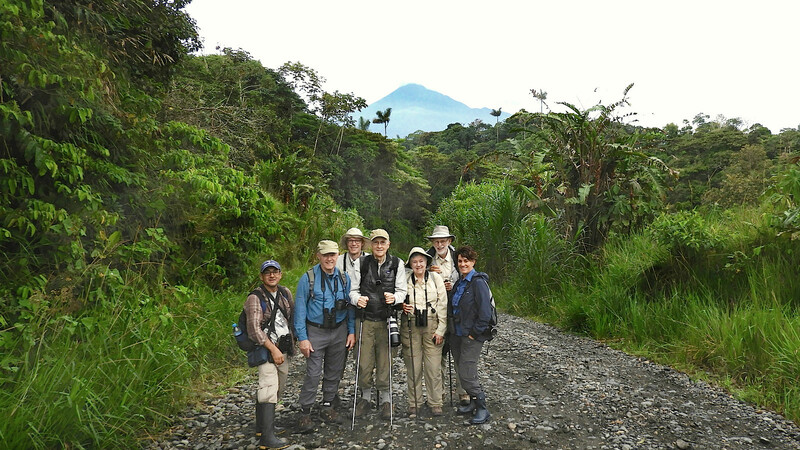 Here's the group on one of our morning starts, with Sumaco Volcano in the background. Photo by guide Willy Perez. Ecuador is so biodiverse, and although this one week tour is short, it is always great. We stayed in only two lodges, but we visited great places at different altitudes, and that makes all the difference in the number of species seen. We started the tour in the dry valley of Tumbaco at 2400m, and gradually climbed to our highest point of 3200m whilst visiting the Antisana National Park, with a superb volcano in the background. 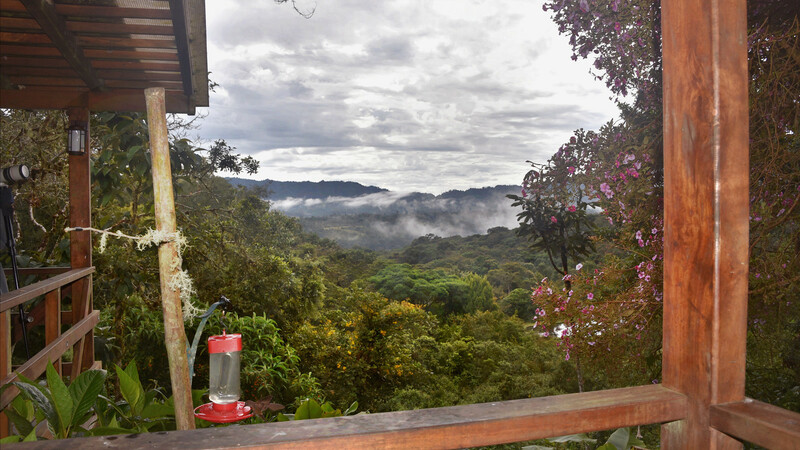 After driving down through dramatic montane forest, we arrived at San Isidro Lodge which is located at 2000m, with the most birdy gardens on the east slope of the Andes in Ecuador. After San Isidro, we settled in for 6 nights at the wonderful Wildsumaco Lodge, with a view of Antisana volcano from the porch. The week was packed full of action from the first day when we visited Antisana, with Andean Condors us, flying by close enough to see the real size of them. Everyone was quite impressed with the number of Carunculated Caracaras along the paramo, followed by great views of Black-faced Ibis and the superb male Ecuadorian Hillstar protecting his territory. 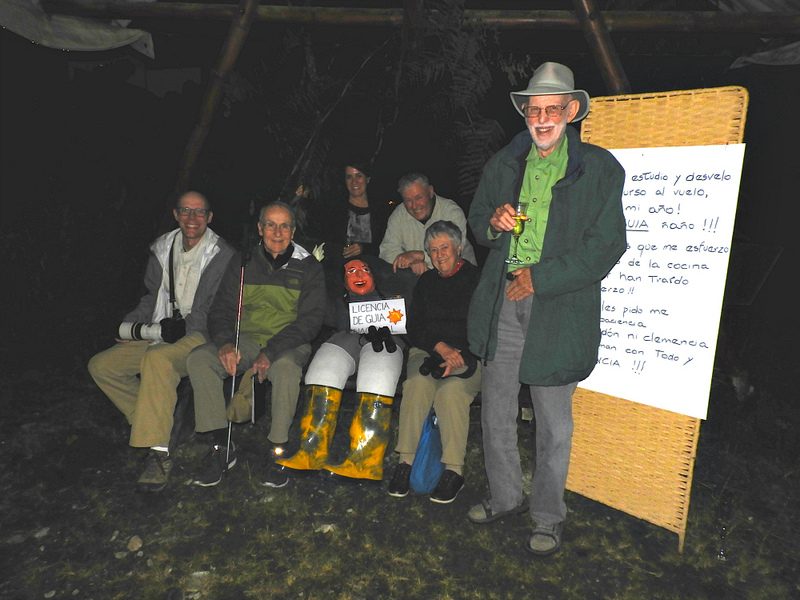 We had a great time at San Isidro, not only with the birds, but also the cultural side. As it was the end of the year (31st December), we were offered a nice glass of Champagne and we burnt the dummy that represents the old year. At the gardens there we saw Masked Trogons, Green Jays, Cinnamon Flycatchers and the little elusive Gray-breasted Wood-Wren that came to eat some moths. 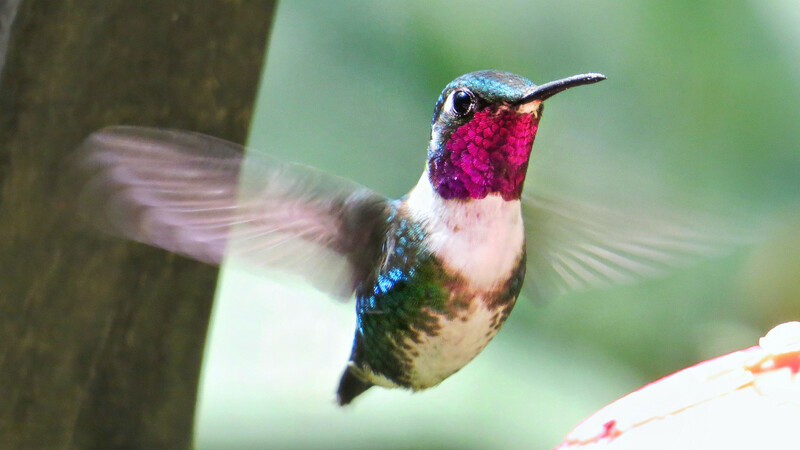 But that was just the warm up for the real stuff..... Wildsumaco Lodge was as impressive as usual, with many fancy hummingbirds like Golden-tailed Sapphire, Wire-crested Thorntail, Booted Racket-tail and fantastic male Gould's Jewelfront, to mention a few. The moth feeders and the Antpitta feeders at Wildsumaco gave us the face to face experience with hard birds such as some of the Antbirds. Finding some of the unique birds of the foothills is always a challenge, but the rewards were super when we saw them, and believe me, you now are ahead of some other birders. Here are some of the superb birds that you enjoyed the most along the way. -The big Andean Condors at Antisana. I mentioned them before, but Condors are the winners of all and there is a reason for that. -Colorful Paradise Tanagers that came in and out several times along the trip just to cheer up our day. What colorful birds! -The noisy Band-bellied Owls that showed nicely just at the car park were a treat. -It was so nice to see the two Military Macaws that saved the day. They were splendid! -What about the sneaky Chestnut-headed Crake that crossed the road. I never expected that, but that is why birding is good fun. -I enjoyed the challenge to find the Western-Striolated Puffbird (I almost took it personally! ), but it was so nice to find it. 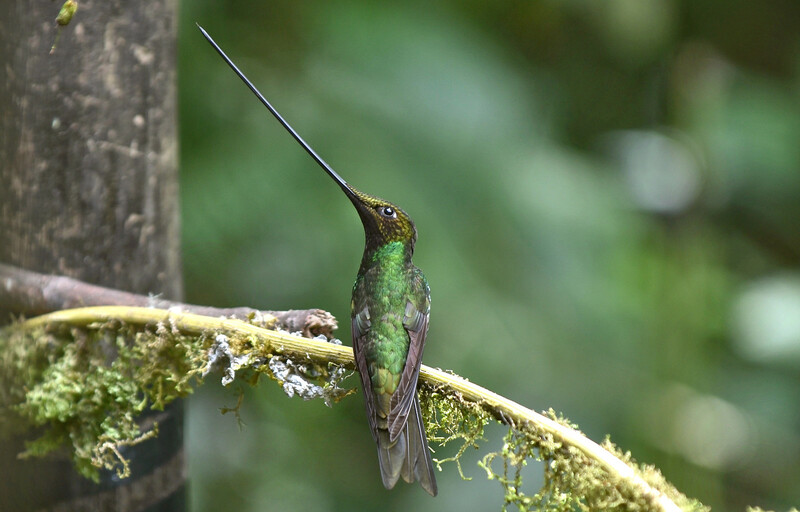 -And for some people, the icing on the cake was the incredible Sword-billed Hummingbird that we saw the last day at Guango lodge. I have to say that the trip was a full-on package of birding and fun. Thank you to all of you for traveling with us, and I hope that we will see you in some more birding adventures. This amazing Sword-billed Hummingbird was one of the last birds we saw, but we were all impressed with that bill! Photo by participant Daphne Gemmill. TORRENT DUCK (Merganetta armata) – A last day prize on our way back to Quito; a pair were just sitting on a rock near Cosanga. WATTLED GUAN (Aburria aburri) – Distant but good scope views of a bird that was displaying on a tree-top at San Isidro. It was so cool; the bird stayed for a long time until George ran to bring Daphne from the lodge. Thanks for the effort, George! SILVERY GREBE (Podiceps occipitalis) – Very few but at least some in Antisana. 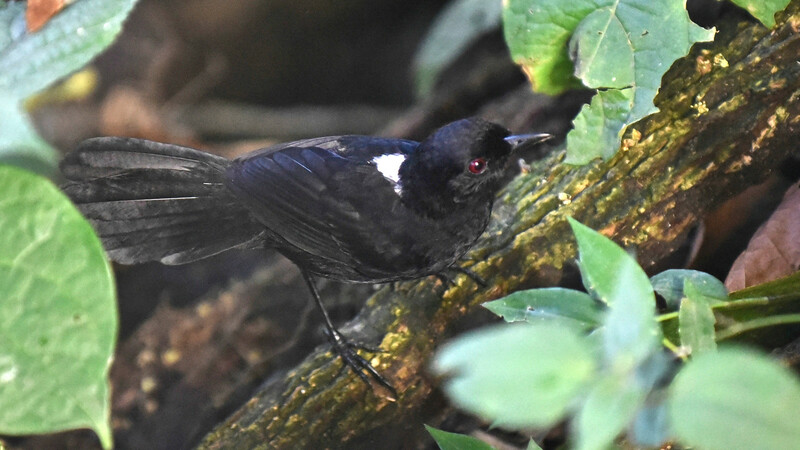 We got a great view of this beautiful male Black-faced Antbird. Photo by participant Whitney Mortimer. SWALLOW-TAILED KITE (Elanoides forficatus) – There were a good number of them at Wildsumaco. VARIABLE HAWK (Geranoaetus polyosoma) – This big hawk was seen the first day at Antisana. BLACK-CHESTED BUZZARD-EAGLE (Geranoaetus melanoleucus) – Adults and young birds were seen soaring with Variable Hawks and Andean Condors at the same time in Antisana. CHESTNUT-HEADED CRAKE (Anurolimnas castaneiceps) – We worked hard for this bird, and in the end it gave up and crossed the road for a quick but good view. SOUTHERN LAPWING (Vanellus chilensis) – The usual group that I believe is very established near San Isidro. ANDEAN GULL (Chroicocephalus serranus) – A couple of them seen at Antisana. 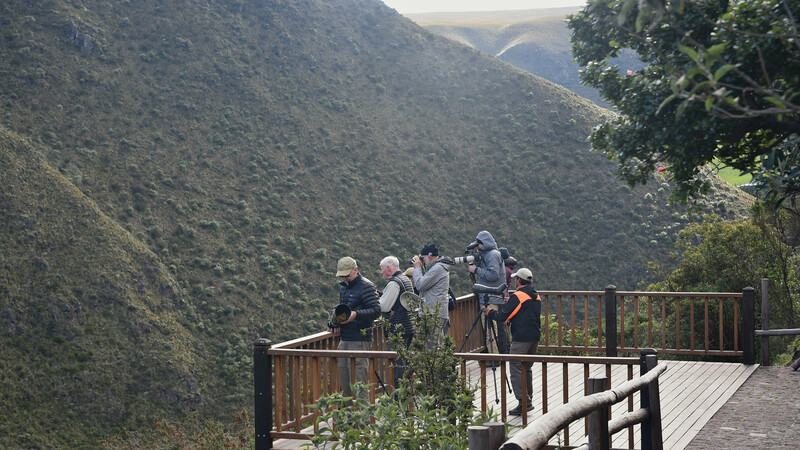 The Condor Lookout at Antisana allowed us to see these magnificent birds really well. Photo by participant Daphne Gemmill. WHITE-THROATED QUAIL-DOVE (Zentrygon frenata) – There was one coming to eat corn near the lodge at Wildsumaco; what a pretty bird! TROPICAL SCREECH-OWL (Megascops choliba) – We had to visit my friend's house to see this bird. It worked out nicely when one was coming to Campeon's house to catch some moths. BLACK-BANDED OWL (Ciccaba huhula) – I like these owls; they are so reliable at San Isidro! 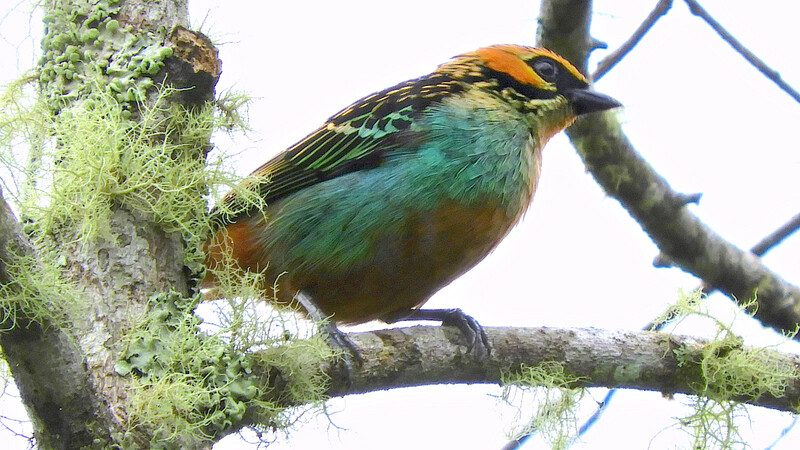 The gorgeous Golden-eared Tanager was just one of many that we saw. Photo by guide Willy Perez. OILBIRD (Steatornis caripensis) – One bird was seen nicely at Wildsumaco. 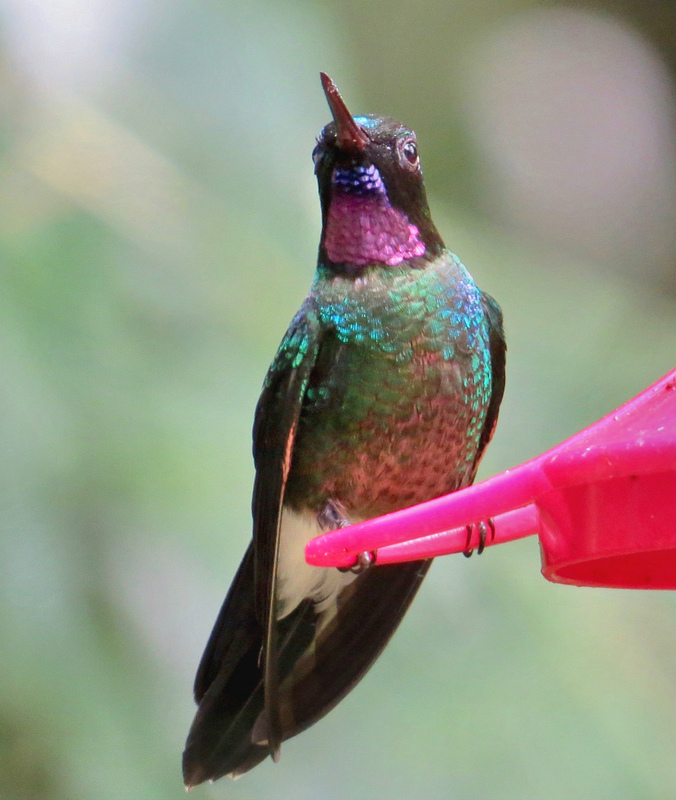 SPARKLING VIOLETEAR (Colibri coruscans) – Very common along the trip. WIRE-CRESTED THORNTAIL (Discosura popelairii) – A few males with a very fancy crest, and some females, at Wildsumaco. 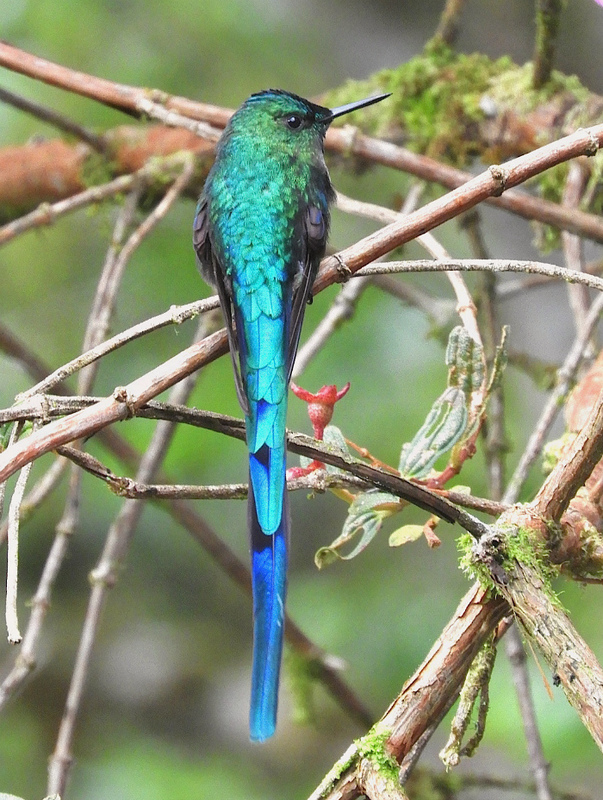 LONG-TAILED SYLPH (Aglaiocercus kingii) – Mostly males with long tails at San Isidro. 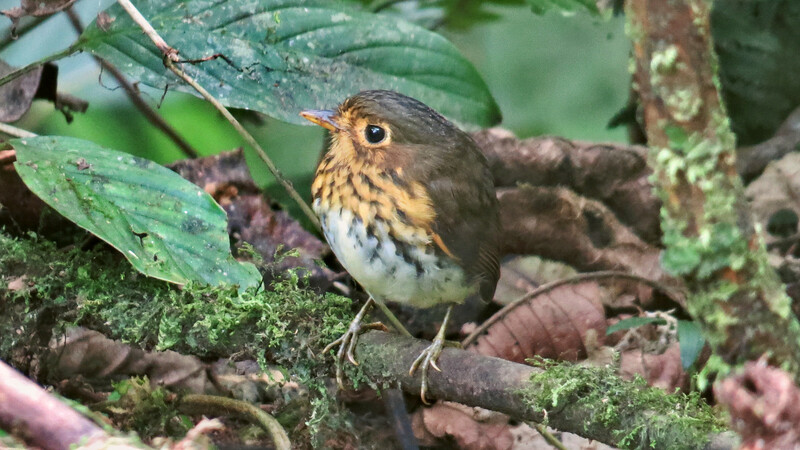 This Ochre-breasted Antpitta was one of the cutest birds we found. It posed so nicely for participant Whitney Mortimer, too! SHINING SUNBEAM (Aglaeactis cupripennis) – Great looks at this unique hummingbird, especially the rainbow rump. GREAT SAPPHIREWING (Pterophanes cyanopterus) – It was a shame, as we saw a nice male but it had a broken wing; we hope that he survived. We saw many fancy hummingbirds, too, including this lovely Tourmaline Sunangel. Photo by participant Whitney Mortimer. 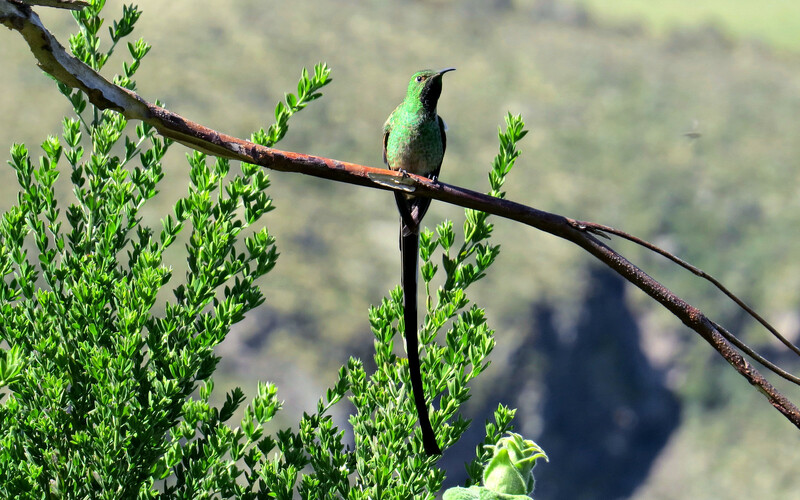 GIANT HUMMINGBIRD (Patagona gigas) – We had to wait but eventually we saw them well, and we definitely understand why they are called giant! GOLDEN-TAILED SAPPHIRE (Chrysuronia oenone) – The most numerous hummingbird at Wildsumaco. COLLARED TROGON (Trogon collaris) – Regularly coming to the moths at Wildsumaco. MASKED TROGON (Trogon personatus personatus) – This is the one that we saw from the porch at San Isidro. BROWN NUNLET (Nonnula brunnea) – Rare at Wildsumaco but we got to see it. GILDED BARBET (Capito auratus) – Fantastic views from the porch at Wildsumaco. GOLDEN-COLLARED TOUCANET (Selenidera reinwardtii) – We had great looks at this very colorful toucanet from the porch at Wildsumaco. 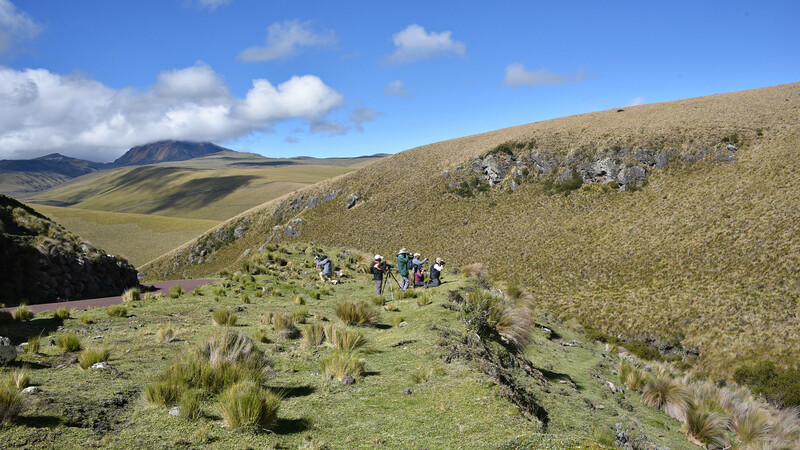 We had a chance to hike in the paramo at Antisana Reserve. This was one of the highest elevations we reached on the tour. Photo by participant Daphne Gemmill. POWERFUL WOODPECKER (Campephilus pollens) – This big Woodpecker showed up nicely during our walks at San Isidro. BARRED FOREST-FALCON (Micrastur ruficollis) – Very vocal at Wildsumaco, just before breakfast. Some people saw them flying around. LAUGHING FALCON (Herpetotheres cachinnans) – This unique falcon that feeds mostly on snakes was found a couple of times along the lower road at Wildsumaco. We visited Campeon's house to see this Tropical Screech-Owl, which was coming to eat moths there. Photo by participant Whitney Mortimer. MAROON-TAILED PARAKEET (Pyrrhura melanura) – Great sightings of this small parakeet around the lodge at Wildsumaco. 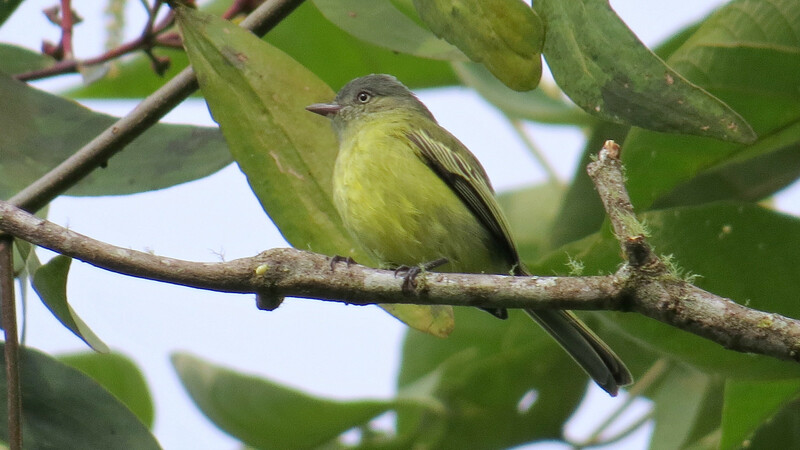 This Red-billed Tyrannulet was seen on the Sumaco Road one day. Photo by participant Whitney Mortimer. ORNATE ANTWREN (Epinecrophylla ornata) – One of the colorful antwrens that we saw near the low hummingbird feeders in Wildsumaco. YELLOW-BREASTED ANTWREN (Herpsilochmus axillaris) – It was great to see this species coming to eat the moths at Wildsumaco. WHITE-BACKED FIRE-EYE (BLACK-BELLIED) (Pyriglena leuconota castanoptera) – Males and females were coming everyday to eat moths at Wildsumaco. PLAIN-BACKED ANTPITTA (Grallaria haplonota) – Still coming to the worm feeders. 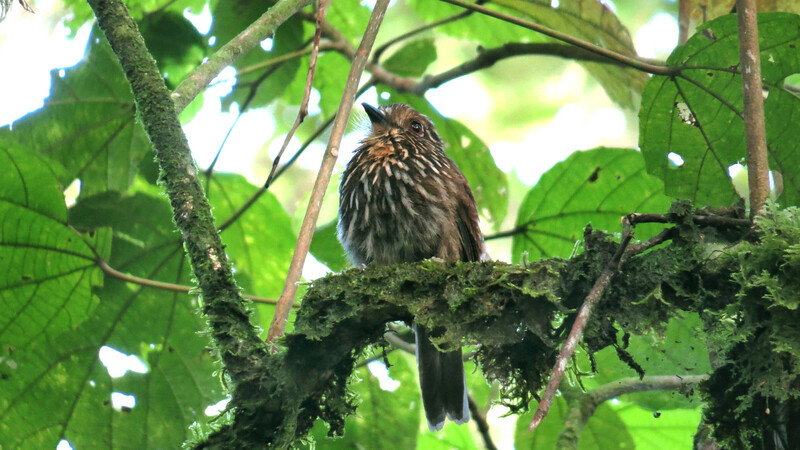 A Black-streaked Puffbird posed very well for participant Whitney Mortimer, who got this great portrait. TAWNY ANTPITTA (Grallaria quitensis) – During our Ecuadorian Hillstar stop, we managed to scope one of this species sitting on a small tree during our visit to Antisana. 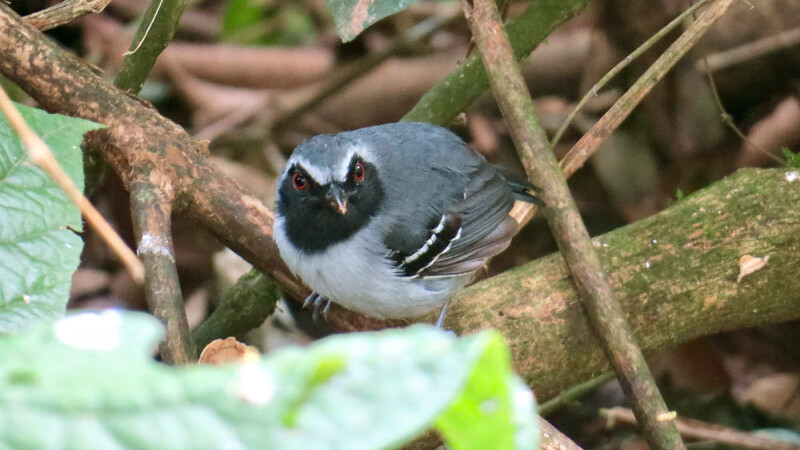 WHITE-CROWNED TAPACULO (Scytalopus atratus atratus) – This is the only tapaculo that we saw. It was quick but nice looks when one came to get some worms at the Antpitta feeding place at Wildsumaco. We celebrated New Year's Eve at San Isidro, where we said goodbye to 2018 in true Ecuadorian style! Photo by guide Willy Perez. CHESTNUT-WINGED CINCLODES (Cinclodes albidiventris albidiventris) – The small cinclodes with a short bill that we saw in Antisana. PEARLED TREERUNNER (Margarornis squamiger) – One of the most good-looking furnariids that we saw in San Isidro. TORRENT TYRANNULET (Serpophaga cinerea) – This small flycatcher that likes to be close to water was seen a couple of times along the trip. 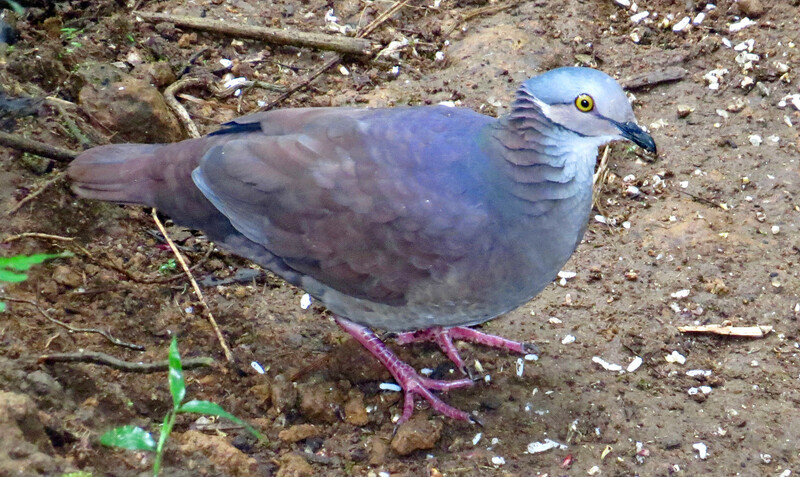 This pretty White-throated Quail-Dove was coming to a corn-feeder at the lodge at Wildsumaco. Photo by participant Whitney Mortimer. ORNATE FLYCATCHER (Myiotriccus ornatus) – A few of them were at the car park at Wildsumaco. CINNAMON FLYCATCHER (Pyrrhomyias cinnamomeus) – Several of them were feeding at San Isidro lodge. CLIFF FLYCATCHER (Hirundinea ferruginea) – Some of them were sitting on a wire close to a cliff nearby on our way back to Quito the last day. 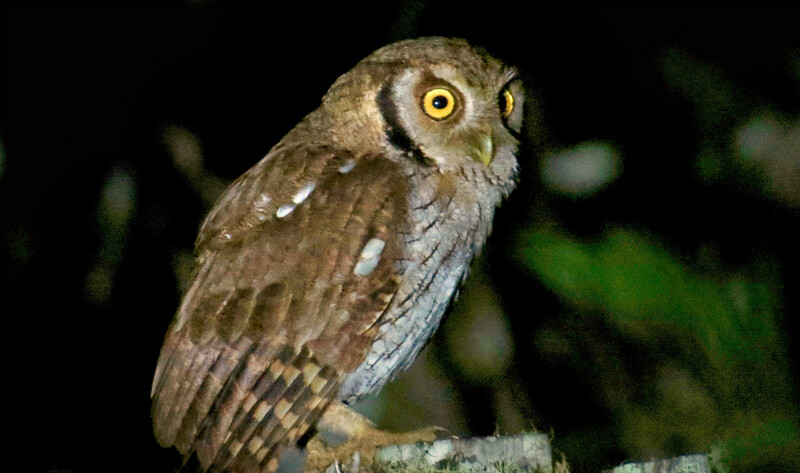 White-backed Fire-eyes were coming to feed on moths at Wildsumaco. Participant Daphne Gemmill got this nice image of one of them. LONG-TAILED TYRANT (Colonia colonus) – At least one male with a long tail was seen nicely at Wildsumaco. LARGE-HEADED FLATBILL (Ramphotrigon megacephalum) – This flycatcher that likes bamboo showed up nicely during our walk from the research station. Long-tailed Sylph is another of the wonderful hummingbirds we saw at San Isidro. Photo by guide Willy Perez. WHITE-CROWNED MANAKIN (WHITE-CROWNED) (Dixiphia pipra coracina) – The common manakin that we saw at Wildsumaco. TURQUOISE JAY (Cyanolyca turcosa) – We had a group of these pretty birds at Guango Lodge. WING-BANDED WREN (Microcerculus bambla) – Mostly heard, but some people managed to see one crossing at the moth feeders. PLAIN-TAILED WREN (Pheugopedius euophrys) – This was the perfect duet that we heard coming out from the bamboo at San Isidro. It got even better when we saw a pair that came out from the foliage. WHITE-BREASTED WOOD-WREN (BLACK-CAPPED) (Henicorhina leucosticta hauxwelli) – Normally these little birds are hard to see but this time a pair was coming to eat moths every day. SPOTTED NIGHTINGALE-THRUSH (Catharus dryas) – A young bird came to eat worms at Wildsumaco. Paradise Tanagers were one of the highlights at Wildsumaco. Photo by guide Willy Perez. PARAMO PIPIT (Anthus bogotensis) – Very well hidden but we managed to see one at the Paramo during our visit to Antisana. Participant Whitney Mortimer got this great shot of a tiny White-bellied Woodstar in flight. BLACK-EARED HEMISPINGUS (Sphenopsis melanotis) – Nice looks at several birds at the car park in San Isidro. VERMILION TANAGER (Calochaetes coccineus) – This red and black tanager was seen by some people the last day of the trip. HOODED MOUNTAIN-TANAGER (Buthraupis montana) – Guango worked nicely for this species, at least a couple were feeding along the trail. ORANGE-EARED TANAGER (Chlorochrysa calliparaea) – A very green bird that we saw at Wildsumaco. 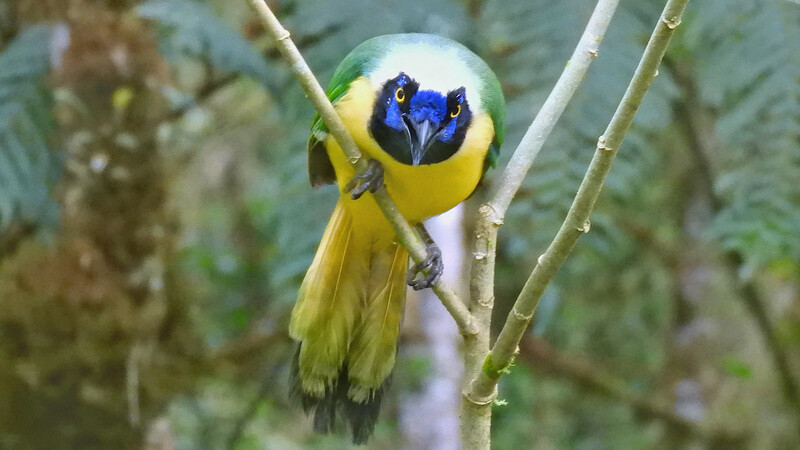 Green Jays are common at San Isidro Lodge. This one seems to be wondering "What are you looking at?!" Photo by guide Willy Perez. BLUE-AND-BLACK TANAGER (Tangara vassorii) – Seen at Guango the last day. 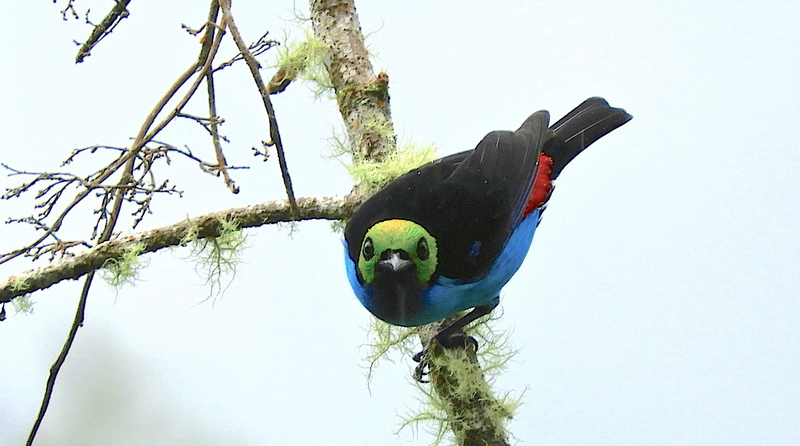 PARADISE TANAGER (Tangara chilensis) – Seen several times at Wildsumaco. Black-tailed Trainbearer is another hummingbird species that we saw well. Photo by participant Whitney Mortimer. BLACK-AND-WHITE SEEDEATER (Sporophila luctuosa) – Small groups of these seedeaters were present at Wildsumaco. SHORT-BILLED CHLOROSPINGUS (Chlorospingus parvirostris) – This was a surprise for us in Guango, normally they are at a lower elevation. 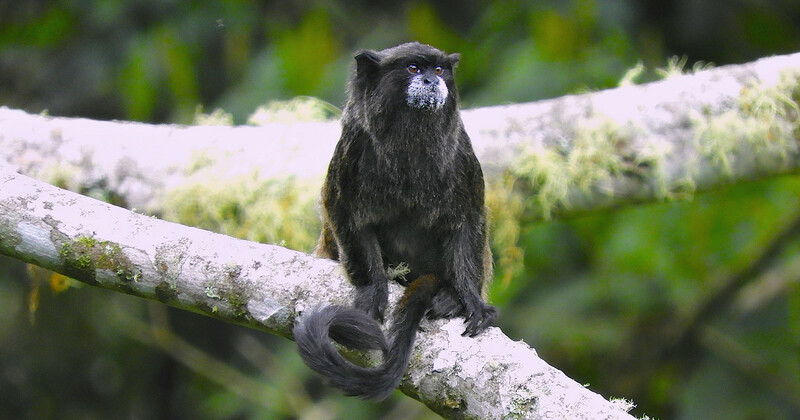 One of the non-bird species that we noted was the Black-Mantle Tamarin that we saw at Wildsumaco Lodge. Photo by guide Willy Perez. CRESTED OROPENDOLA (Psarocolius decumanus) – The large oropendola that we saw at Wildsumaco. The view from San Isidro Lodge was very lovely! Photo by participant Daphne Gemmill. BLUE-NAPED CHLOROPHONIA (Chlorophonia cyanea) – Some people managed to see a male feeding on the Cecropia fruits at Wildsumaco. RED-TAILED SQUIRREL (Sciurus granatensis) – We saw this species at San Isidro. NORTHERN AMAZON RED SQUIRREL (Sciurus igniventris) – This is the one found at lower elevation. Blunt-headed tree snake (Imantodes cenchoa), Stag-horn Beetle, many spectacular moths and also many butterflies.